Furthermore, the ESU-video ‘My Story, our Europe‘ premiered.It was done to emphasize the role that each of us has as a mirror and as leverage in the society. Many older persons witnessed where war and injustice lead to and therefore they assiduously strive to a united Europe. The movie attempts to start intergenerational dialogues with young people. “We do not want a gap between generations”, said President Hermans. “In respectful conversations between generations we want to develop common perspectives and, beyond generations, continue building a Europe that is united in solidarity and responsibility.” This was followed by a panel discussion with Eva Majewski, Honorary Chairwoman of the European Democrat Students (EDS); Lawrence Cappelle, Head of Office of the European Union of Christian Democratic Workers (EUCDW); and Marilyn Neven, Programme Manager of International IDEA Office to the EU. It was then time to go ‘back to the future’ with Prof. Steven Van Hecke of the Catholic University of Leuven, who gave an overview of 20 years European Seniors’ Union and the background in which this happened. Furthermore, after some reflections about the ESU were made by Carmen Quintanilla, Vice-President of the ESU, the necessary and well-deserved tribute was paid to Dr. Bernhard Worms, President of the ESU for 12 years and succeeded by An Hermans in 2013. They were awarded by Prof. Nikolay Andreev, Vice-President of the ESU with a golden medal for their work from the Technical University of Sofia, Bulgaria. President An Hermans then took the opportunity to thank all other persons who played an important role in the history of the ESU. Dr. Bernhard Worms continued by giving some new perspectives for ‘Youth and Seniors in Europe’ and introducing a new foundation: Jugend und Senioren für Europa. 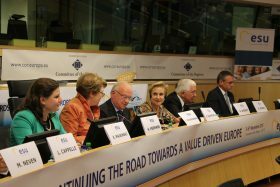 President Hermans concluded by looking into the future of the ESU towards a value driven Europe. When the technical support failed to play the European Anthem to round off the celebration, the European seniors showed their adaptability by singing the anthem a cappella.